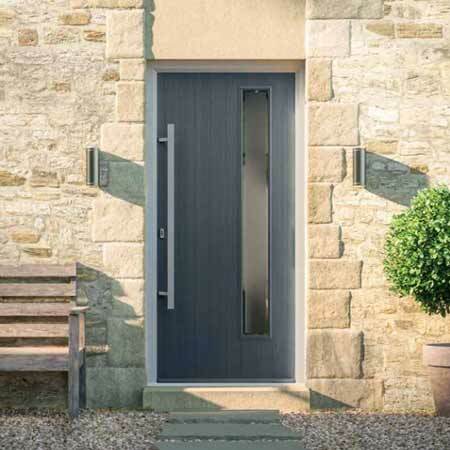 Composite doors are now the preferred choice of double glazed external doors for many homeowners, diyer's and tradesmen due to the huge advantages that composite doors have over the alternative wooden doors, steel doors, upvc doors and most other external doors available. Durability, strength, security, thermal efficiency, weather resitant, low-maintenance and life expectancy to name just a few of the great benefits of a grp composite door. 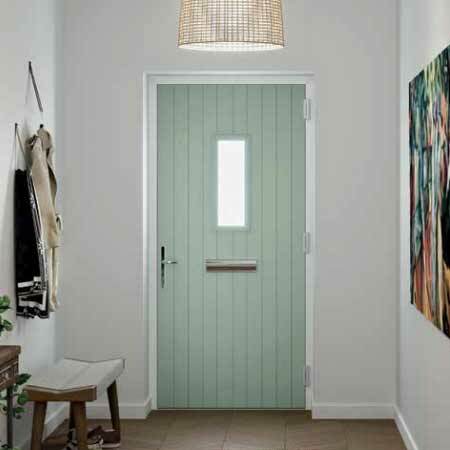 The composite door features a GRP compression moulded door skin and a timber woodgrain effect with a Polyurethane thermally insulated core achieving an authentic timber door look, furthermore a unique and patented reglazable cassette system. Our diy made to measure composite doors supply only are manufactured to a very high standard, Police approved specification and with a certified thermal performance. Offering quality grp composite doors and timber solid core composite doors which will leave you with more time to enjoy your new exterior door rather than continually maintaining it. Available in over 900 billion combinations with an a array of composite doors online, from the classic traditional Georgian and Victorian style to the ever increasingly popular modern and contemporary along with an extensive choice of secure door locks, hardware suites, standand colours and bespoke superior colours including black, blue, green, red, white, oak, darkwood, chartwell green, cream, grey, duck egg blue, poppy red and black brown. We can also offer colour matching to any RAL, Farrow & Ball and BS colour. A choice of colour is available both sides of the door and upvc frame on our fantastic range of composite door styles. Coloured foil finished frames designed to match most profile systems offer excellent matching options to any existing double glazing in your house and with an excellent choice of contemporary and modern door hardware, available in chrome, gold, black, graphite (brushed chrome), white and brushed stainless steel. As standard, composite doors are supplied prehung in a upvc frame with a luxury door hardware suite, a PAS24 Police approved high security multipoint locking system and anti snap cylinder offering the utmost protection and safety for you, your family and your home. A premium security upgrade is also available to further enhance security features achieving the full Secured by Design specification. DIY composite door prices are available to buy online from just £445 inc VAT supply only - we may offer the best price and cheap composite doors for sale but rest assured the door quality and customer service from Just Doors UK is second to none, please check out the customer reviews page. Buy your new door direct from the UK's trusted and leading composite door supplier. We supply diy and trade composite doors for sale to the general public and diyer's, construction companies, renovation companies, builders. The majority of external front doors we offer can be delivered within 5-15 working days, prehung in the frame and ready to fit. You will get a new composite door, fabricated to your specification and of the highest quality and at great trade price! Just call our sales team on 01530 273365 to buy your new exterior door today from the UK's trusted and leading door supplier! We now offer over 900 billion combinations of composite doors online available to buy! Our solid cottage style composite door set achieves a `U` Value of 1.0 and an energy rating of A, while our half glazed Composite door achieves a 'U' Value of 1.4 - great numbers for keeping the digits on your energy bills low. The warm edge spacer bar technology in many of the double glazed units are even more efficient. It gives the composite doors a better overall energy rating compared to other UK composite doors available. Lower energy bills and better for the environment. Our GRP composite doors give you a nice warm feeling - all year round. Take a look at how well our composite doors perform compared to the rest of the market. (Information from HAPM (Housing Association Provident Mutual) and BRE (Building Research Establishment)). The door drip is the strip that runs across the face of the composite door at the bottom, it deflects running water from the bottom of the door. Drips have been made to match the colour of your door so it doesn’t stand out, not a silver or gold bar found on alternative composite doors. * Colour coded door drips not available with bespoke RAL colours. 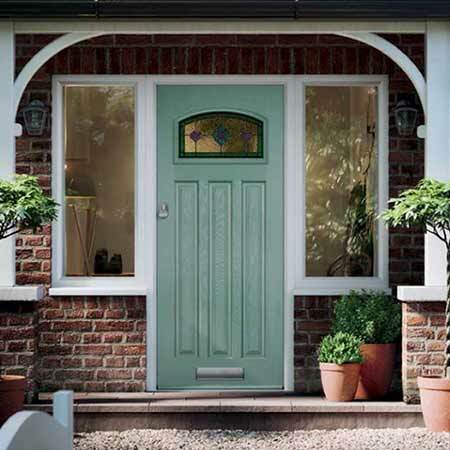 Composite doors are available in 13 standard external door colours; black, red, green, blue, white, oak, darkwood, chartwell green, cream, grey, duck egg blue, black brown and poppy red. RAL, Farrow & Ball and BS colours are available upon request. As standard, the internal door is white grained. The solid colours are pre-pigmented which means the colour is added during the manufacturing process. As the skins are applied, the colour goes on evenly. The oak and darkwood finish is a hand-applied stained finish to give depth to the woodgrain. All composite doors have a high gloss, UV resistant film to give them a final sheen. We've looked at every detail of our GRP composite doors, and edge banding is no different. The edge of the composite door is finished using an ash grained PVC. Once the edge has been applied, it is then trimmed and the edges milled to a radius so there are no sharp corners. Every composite door boasts a Glass Reinforced Plastic (GRP) woodgrain skin as standard. The composite doors are fitted with a PAS24 Secured by Design Police Approved multipoint hook lock and a high security anti-snap cylinder as standard. 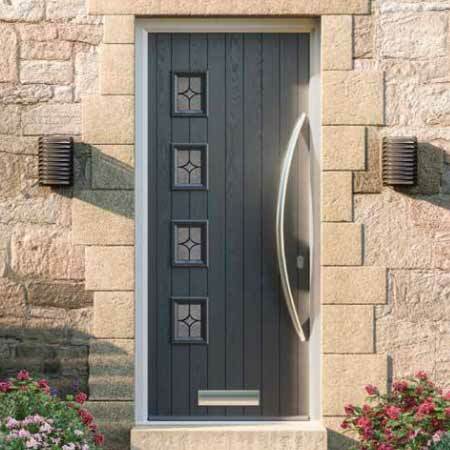 The composite door has a dedicated design for the low threshold specifically for the door and is Part M compliant. It has concealed face drainage and a thermal break. Adding a top box is simple with our composite doors. Because the frame has a dedicated transom bar, it is made in one piece. This makes it extra strong and looks good. The glass pattern will match the glass pattern chosen for the main glass design. So if you've ordered Crystal Diamond on Stippolyte, the top box can also be in Stippolyte. 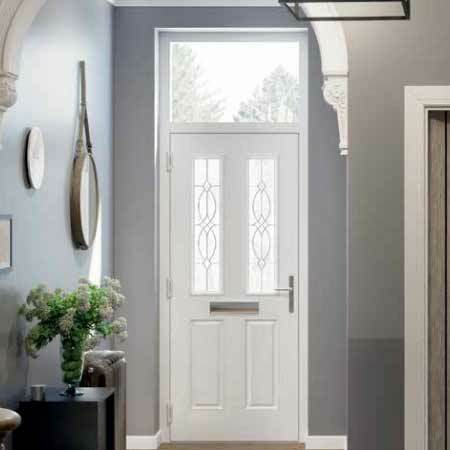 The composite door has fully suited hardware so whether you choose gold, chrome, black, graphite or white hardware to finish your door, you can be sure of a perfect match. Everything from knockers and numbers to handles and hinges are designed as a complete suite. Gold finishes often tarnish, but with the hardex gold finish the gold has been toughened to withstand even the harshest elements. Our composite doors are being tested to the highest levels. All ready to install composite doors will conform to PAS23 and PAS24 as standard. These doors will also carry the annexe D accreditation that tests the continued operability of the door after a simulated aging process. The new TDS standard, with the gusting test, have also been included. Please note unglazed composite doors carry no certification. Side panels use the same composite door frame for a perfect colour match. They are available glazed or with a matching composite side panel. 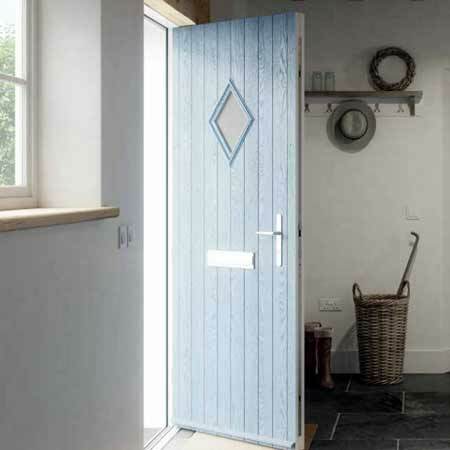 Glazed panels are internally glazed and unless specified will automatically come with the same glass pattern as the main door, so if you ordered the Cottage Half Glazed Composite Door with Cotswold glass, the glass pattern in the side panel would also be Cotswold. Glazed panels can also be fitted with the unique transom section. All GRP composite front door and side panels are fastened to the composite door frame using heavy duty 20mm aluminium coupling sections and then clad in PVC.